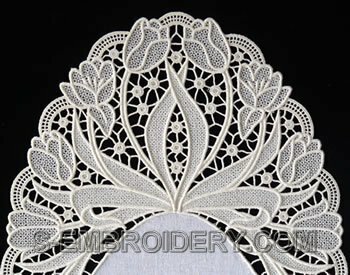 A set of 6 freestanding lace machine embroidery designs that will create a beautiful tulip lace doily. Each design is available in 2 sizes. The smaller ones will fit in 5x7 (130 x 180) hoops and the larger version will fit in 5.5 x 7.9 (140 x 200) hoops. 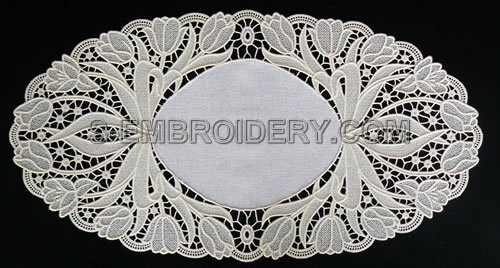 The size of the larger doily is around 22 x 11.5 inches (56 x 29 cm) and the smaller one will measure around 19.5 x 10 inches (49 x 25.5 cm). The set comes with instructions in PDF format for putting the lace doily together.